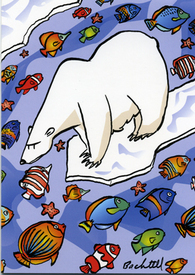 Last summer the Arctic suffered a record loss of ice sheets. Alarmed scientists issued some disturbing conclusions: global warming has reached the point of no return and is permanently altering the earth’s ecology. This may be debatable, but scientists agree on one thing. If trends continue — and they are proceeding more rapidly than first thought — the Earth will eventually become uninhabitable. • unknown, potentially dangerous, consequences from reckless use of bioengineering. Humanity faces a stark choice — life or eventual extinction. If the choice is life, then a new sustainable economy that harmonizes with nature and preserves Earth for future generations must be organized. There is growing global awareness that the source of the crisis is capitalist plundering and that urgent action is necessary to save the Earth. Can capitalism harmonize with nature? Can capitalism be reformed to harmonize with nature? This question is engaging millions, including enlightened capitalists aware that the very future of capitalism depends on solving the environmental crisis. In their view, capitalism must see the opportunity (profit) in sustainability. People are products of and a part of nature and evolve together with it. They interact with nature to produce their subsistence using its resources, their labor and the technology they develop. This interaction alters nature. All previous societies in human history have had an exploitative relationship to nature. Examples abound where societies ruined the immediate environment they depended on, leading to their own doom. However, never before has all life been threatened with extinction. The social production and distribution of goods make up economic systems. Capitalism is a rapacious and irrational economic system that exploits human labor and nature for short-term maximum profits and accumulation of wealth by a few. That is its essence. For capitalism, nature is a thing to exploit, a source of raw materials to produce commodities and a place to dump waste. This inevitably puts capitalism at war with nature. Capitalism has created immense production capabilities that could meet the needs of most of the world’s people. However, as environmentalist Barry Commoner pointed out, post-World War II capitalist development has also been marked by the introduction of productive methods that are more destructive than ever. These production methods were introduced because they were more profitable. They included mass production of high-powered automobile engines (with the accompanying destruction of mass transit systems in most American cities); industrial farming techniques using massive amounts of inorganic nitrogen-based fertilizers, petroleum-based pesticides and animal feedlots; scores of new industrial chemicals including phosphates; and synthetic clothing materials and disposable plastics. These became models of economic development adopted globally. There are limits to the ability of the Earth’s ecology to absorb the destructive impact of these forces. The capitalist system is exploiting nature far faster than it can renew itself and discharging pollution far faster than nature can absorb it. And capitalist globalization is accelerating the environmental crisis by intensifying exploitation — the global race to the bottom in wages, working conditions and environmental protections. Capitalism has created tremendous imbalances in global wealth. Developing countries cannot attain the same economic level as the advanced capitalist countries through the wasteful and destructive capitalist path. It is estimated it would take seven Earths to accomplish this. Driven by the very essence of the system, capitalists are forced to compete, seeking ever-expanding markets or perishing. They are forced to lower costs on wages and raw materials and foist environmental costs on communities. To maximize profits, capitalists never willingly accept the full costs of replenishing the environment and eliminating waste. It is invariably working-class communities and especially communities of color that suffer the worst of corporate pollution. Capitalism is a system that engenders wars of conquest for natural resources. As military technology has become more powerful, it has also become more destructive of the environment. The production, testing and actual use of nuclear weapons has caused long-term environmental and human damage. Iraq and Vietnam will be dealing with the deadly consequences of U.S. weaponry like depleted uranium and Agent Orange for generations to come. Thus, capitalist development comes into conflict with the limits of nature and is inherently destructive of the environment. The crisis of the environment is a crisis of capitalism. The problem is not one of more enlightened capitalists and corporations. We must elevate the fight to protect the environment against corporate destruction today. However, every gain under capitalism is temporary and threatened with being taken back by the corporate ruling class. Our urgent environmental crisis coupled with the need to overcome global underdevelopment raises the urgent necessity for a radical transformation of social production to a system that harmonizes with nature. Only socialism — public ownership and grassroots management of the means of production and natural resources — has the capability to do this. The aim of socialist production is to meet the needs of society, not private profit. In contrast to the anarchy and competition of capitalism, socialism is a cooperative system of planned production, allocation of resources and technology, capable of developing society in harmony with nature. For example, energy production based on burning fossil fuels is the largest contributor to greenhouse gases. The technology exists for pollution-free energy production including solar and wind technology. However, powerful energy corporations and their White House friends are preventing this technology from being used system-wide because it is not as profitable. A socialist system would seek to reorganize production entirely using non-polluting renewable sources. In doing so, it would create millions of new, socially useful jobs. Implementing these technologies and cleaning up environmental destruction would require tremendous social subsidies, something capitalists will not pay for. Only a planned system can cooperatively mobilize society’s scientific, technical, and human resources to radically change production methods and address the scale of destruction left behind by capitalism. Only a community of socialist states can mobilize the necessary cooperation on a global scale. Even societies building socialism must be conscious of the need for sustainable development. Just as eliminating racism and sexism is not automatic, development of a sustainable economy is not automatic either. During its early years, the Soviet Union adopted a revolutionary environmental policy. But in the race to overcome underdevelopment, they abandoned it. The Soviet Union and Eastern European socialist states adopted harmful capitalist industrial processes. The Marxist understanding of the relationship between society and nature was distorted. Only later, as the environmental destruction became apparent, did growing environmental consciousness begin to influence development. These processes are occurring today in other socialist-oriented states, including China and Vietnam, who are seeking to overcome underdevelopment. Destructive capitalist production techniques fouling air and water are creating a growing environmental consciousness that the governments must respond to. Cuba has a unique history because it adopted sustainability practices out of necessity during the “special period” after the collapse of the Soviet Union. Today, Cuba is a world leader in organic farming. Democracy is at the heart of socialism. Deepening and expanding grassroots democracy is an essential element in the development of sustainable socialism. If a community or workforce has the power to determine production methods for publicly owned production, they will demand pollution-free workplaces and communities. They will allocate resources to make their lives better and more enjoyable, including more parks, clean air, rivers and beaches. Saving life on Earth urgently demands a revolutionary transformation of the relationship of human society to nature. Capitalism has proven it is outmoded and an obstacle to change. That is reason enough for a wide-ranging public discussion about a sustainable socialist USA beginning now. John Bachtell (jbachtell@cpusa.org) is district organizer of the Communist Party of Illinois. Bill Mackovich is a retired steel and hospital worker.